A Business Card Idea That Will Make Christian Bale Go "Psycho"
Tonight I have a networking function, and I have decided once and for all to end the embarrassment of not having a business card. All too often I am asked, "Hey, do you have a business card?" and all too often I must truthfully reply, "No." Personally I never saw the true impact of exchanging information on paper, especially when you have an iPhone in your pocket and you can go directly to my website. Long gone are the days of American Psycho, where business men one up each other's business card design. Or so I thought. Not being able to supply a business card is embarrassing for me and I can always see the skepticism in the persons eyes when I cannot produce one on the spot. While most business is done online on your smart phones, laptops, and iPads, a business card still says "Hey! I mean business!" So, if I am going to carry around a business card, it will not be typical. It will be innovative and it will be sure to be remembered. And, to be safe, I will not show it to Christian Bale. The following is the Finnovation Product Development Tactical Design approach to eliminating my business card problem all while showcasing the possibilities of 3D Printing and rapid prototyping to potential clients. Step 1: I will design an embossing template with my company logo and all relevant contact information. I will do this using AutoDesk Inventor to create a virtual model of the design. In the end it will resemble a credit card with raised letters, but our version will be designed for form as well as function. Step 2: Once the design has been finalized within the CAD program, it will then be sent to our Dimension 3D Printer. This 3D Printer will create a solid embossing plate out of durable ABS plastic and maintain the precision tolerance of a CNC machine. No molds are needed to reproduce this design. The Design can be modified with other employees information easily so that the entire company can be equipped with this new business card concept. The possibilities are endless, but for now, we are going to demonstrate a simple principle with a simple, yet effective design. Step 3: Testing the design is a must. The design must function perfectly and be durable enough to work for years. The design must be able to handle the many different types of paper materials and various thickness. I will use various materials to use for the embossing process. I will also need to figure out how much pressure it is going to take to adequately emboss the material. Phase 2 : Revisions Based on Test. The first design phase of this project was a relative success. The embossing plate works in its basic function, but it was not a smooth enough process. For the revised design, I will focus on the "marking" process to provide a more consistent and effortless result. I will also experiment with different font types to see which one will provide the smoothest, and most legible result. So, back to the drawing board to refine this initial concept into a functional but simple design solution. Stayed tuned to www.finnovationpd.com for more ideas on how to use 3D printing and rapid prototyping technology in your world! 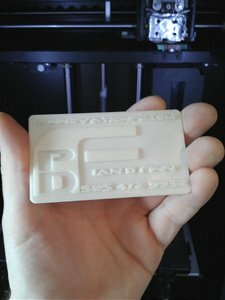 Click here to view our 2nd blog on 3d Business cards.